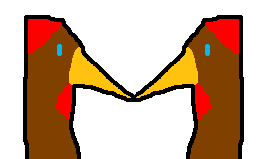 Here we have the letter M. It's made of two chicken styled pointy bits. I think it looks pretty good, though the combs probably could have used a bit of flare. Sorry this one's so short but I've strangely enough already run out of things to say about this one. cool! twee kussende kiekens! ik vindt dit leuk! dat is de eerste letter van mijn naam!